Sometimes I seek the stories out, walking along beaches and streets, sitting having a morning coffee and listening to conversations and, of course, meeting new people. But occasionally, inspiration finds me. The dark-bricked Christ Church Cathedral sits atop a ridge in the Newcastle suburb, The Hill. It is a commanding presence, demanding obedient acknowledgement. 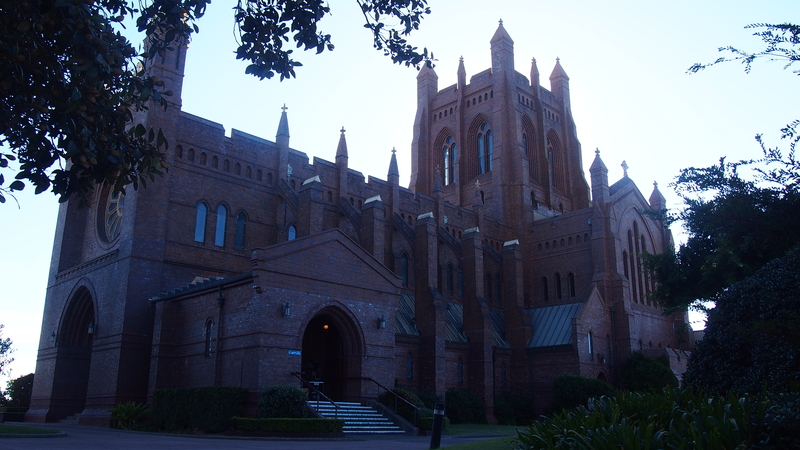 From the King Street entrance, the Cathedral looms above, beautiful Moreton Bay Figs casting much-needed shade over a staircase winding through the park grounds to the Cathedral. The first flight of stairs isn’t out of the ordinary, grey cement, low risers and a steel handrail leading up the lower slope. But the second flight of stairs changes, they become more than just an access way up a particularly steep pathway. 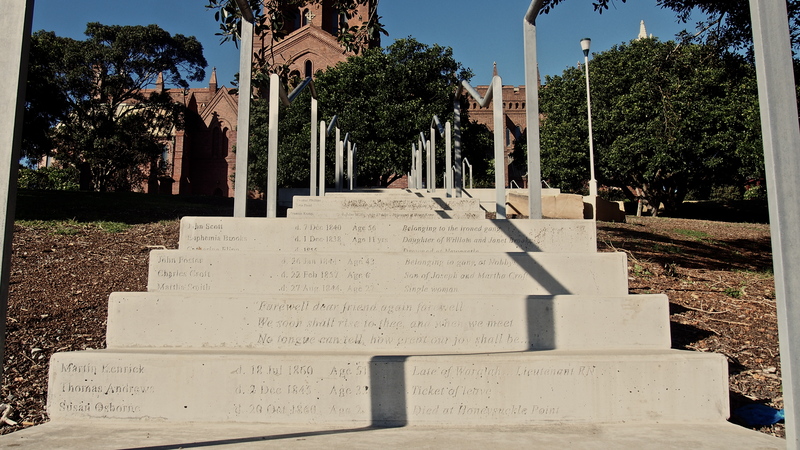 On each of the risers the names of three people are engraved, detailing the age, any known relatives, the profession or place in society and the date of death. 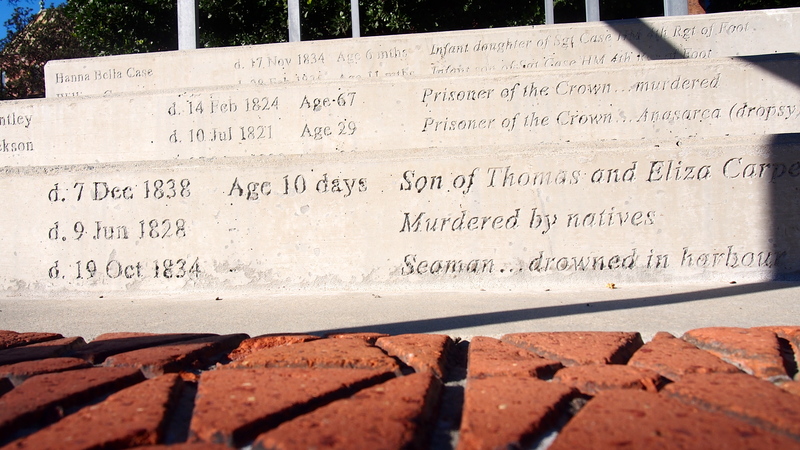 Each step is a memorial to three of the two hundred and fifty-eight people, the men, women, children and babies who had died and were buried in the churchyard. this is all that remains of their stories; their graves and gravestones long-fallen into such a sad state of disrepair, that they could not be salvaged. For some, there is little more to say, an infant who struggled for eleven hours before dying, leaving nothing but the grief of parents. But others hint at more sinister deaths and circumstances; ‘murdered by natives’, how? and why? I immediately wonder. Or the tragedy of three young siblings killed in a bushfire. There are many drownings in the harbour and off the beaches, recalling a time when even professional seamen couldn’t swim. And what of their families back in England, Scotland, Ireland or Wales? Did they ever learn that their loved one was buried in Newcastle soil, above rich coal seams? Behind these briefest and barest of summaries of two hundred and fifty-eight lives there are stories, ideas for stories, stories that could be updated, given a contemporary context, stories that could be used for a story’s starting point or woven into an existing story. Perhaps they may even form the basis of a blog post. A reminder that inspiration is all around us and sometimes we only need to take a different path, turn left and climb a set of stairs to be reminded. 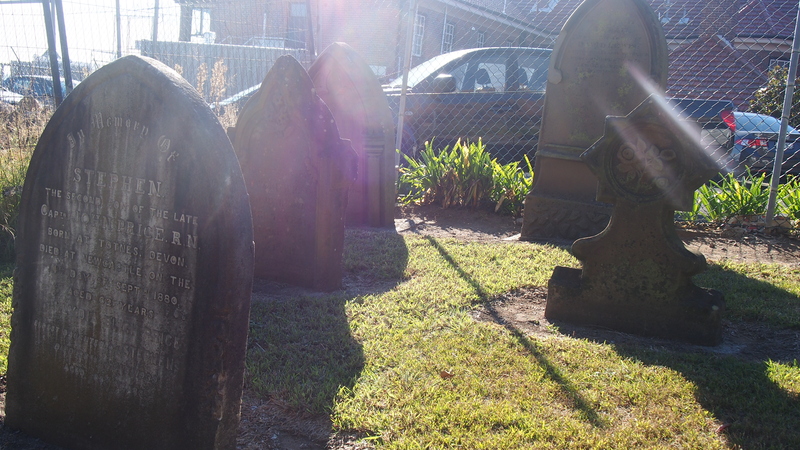 All that remains of the graveyard today – some headstones are so worn they are no longer legible. 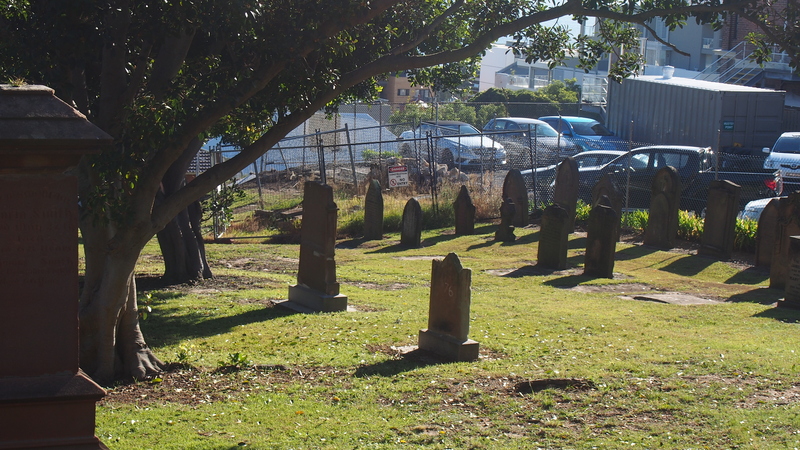 As I reached the top of the hill, walking passed the remains of the graveyard, incongruously positioned next to a very unattractive carpark beyond the cyclone-wire fencing, I turned back and took in the view. Two hundred and fifty-eight names bearing witness to the busy lives of contemporary Newcastle, the harbour and Stockton beyond, the industrial landscape of the busy port and all the stories waiting to be told. This entry was posted in Filling The Well, Writing and tagged Christ Church Cathedral, creativity, graveyard, inspiration, Newcastle, Newcastle history, stories by jennifersmart. Bookmark the permalink. Always lovely to wander in a graveyard, so many stories. I hope to end up in one, can’t bear the thought of being cremated. 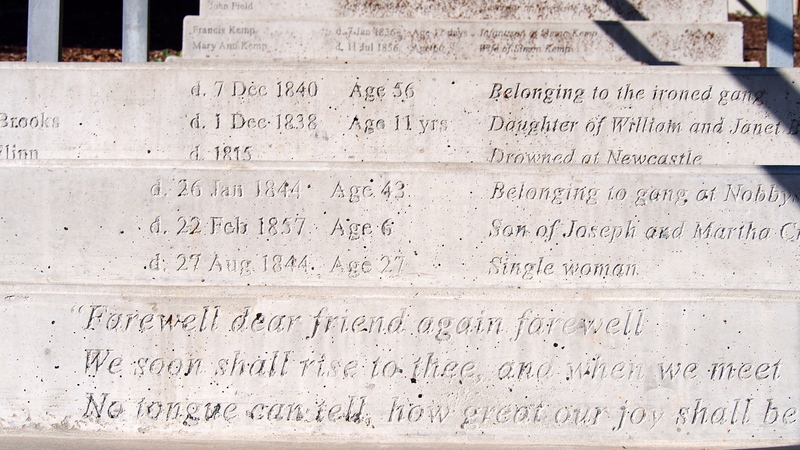 I’m after the full headstone etc etc What has taken you north? ?